Businesses are obligated to keep their property safe for their customers. Part of that safety stems from keeping the floor clean, dry, and well-maintained enough not to trip you up. If you're involved in a slip and fall accident, you'll have to prove a dangerous property condition existed that caused the accident and that the business had notice of said condition. That said, if you are injured because of poorly maintained flooring, you may be entitled to a settlement. Learn what types of injury you may have and what factors influence the kind of compensation you can win. As with any kind of personal injury case, your best chance of winning fair compensation is to work with an experienced attorney. Falling in a public place may be embarrassing. Your initial reaction may be to get up and pretend nothing happened. However, if you slipped on a wet or uneven surface in a place of business, pause before getting up. Assess the pain you feel in your body before jumping up to negate the embarrassment. You don’t want to do your body any more damage by trying to move on too quickly, and you need to take enough time to figure out what happened. The most common injuries after a fall are minor — typically cuts, abrasions, and bruising. Depending on the condition of the surface, you may experience abrasions on your arms and legs and bruising on your hips. Small cuts and bruises are usually easy to treat. However, if the fall is bad enough, you might experience significant bleeding as well as large bruises and abrasions, which will take time and medical care to heal properly. You may also experience other moderate or severe forms of injury. For example, a sprained or even broken wrist is a potential result of trying to break your fall. Back injuries are also relatively common after a fall, especially if you twist while falling in an attempt to halt your fall. According to the University of Iowa Hospital and Clinics, you may experience strain in the deep muscles of your back, which could cause you severe pain and loss of mobility. Head injuries are also unfortunately common after a slip and fall. If you hit your head, you'll definitely want to be cautious in how you proceed. Be aware of any swelling, bleeding, or loss of consciousness. Swelling and loss of consciousness could be signs of a concussion. If you hit your head hard enough, there's even the danger of a more significant head injury, such as a brain bleed. If you think there's any chance you've suffered a significant injury because of your slip and fall accident, have the business call you an ambulance. Even if the injury isn't so severe, consider seeking medical attention for cuts or sprains. Medical bills can pile up — starting with the ambulance, if you had to take one. In fact, the accumulation of medical bills is a measuring stick of calculating your injury damages. This calculation is an important first step to filing a personal injury lawsuit. 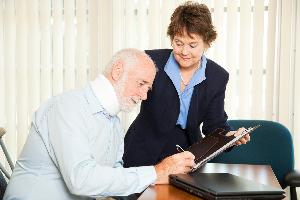 When you file a personal injury lawsuit, you're suing to recoup what you lost because of the accident. In this case, you'll want the business to cover any medical bills that result from the injury. These bills include not just the initial doctor or hospital visit but also any follow-up care or physical therapy needed. Future compensation may be based on a prediction of follow-up care costs. Work with an attorney to make sure that the amount of compensation you seek will cover all of your medical costs. Depending on your job and the severity of the injury, you may have to miss work. You may be entitled to compensation from missed wages. If the injury impacted you long-term, you may even be eligible for compensation based on loss of earning capacity. For example, say you work with your hands. During your fall, you tried to prevent the impact and suffered torn tendons in your wrist. You might not be able to return fully to work for a long time — or at all if the damage is permanent. An attorney will understand how this situation impacts your settlement. A business must provide a safe environment, but you have responsibilities, too. You're likely to be subject to a comparative negligence rule. This rule states that you have to be reasonably aware of your surroundings. For example, if you don’t see a posted Wet Floor sign because you were distracted by your phone, you're not going to have as solid of a personal injury case. If you've been involved in a slip and fall accident, keep documentation of the incident as well as medical bills and lost wages. Consult with Clearfield & Associates, about your potential premises liability case.